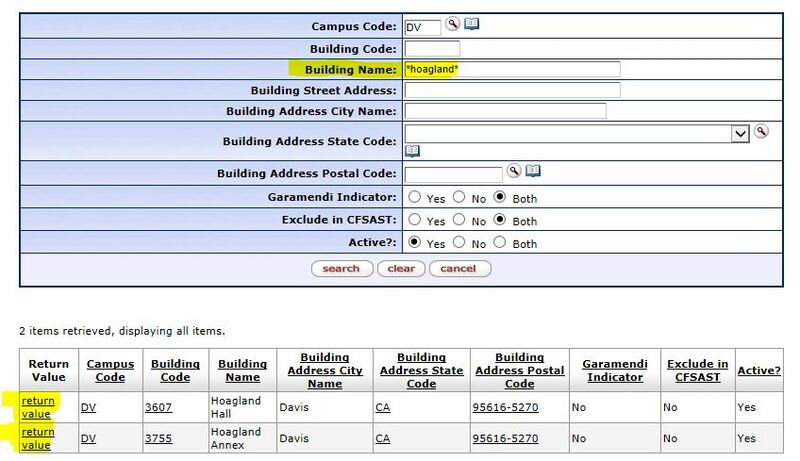 The Building and Room fields identify the UC Davis building (owned or leased) and room number where a capital asset is located. When completing a Requisition document citing Capital Equipment (at or above $5000), or updating an Asset screen location, you will need to complete the Building and Room fields. You will also see the Building and Room fields on the Asset Fabrication, Asset Global (Add) document, Asset Location Global, and Asset Transfer Global. Where are the Building and Room Fields Located? Once you've located the Building Code and returned it to your document , click on the icon next to the Room field to access the Room Lookup. The Building that you previously returned to your document will default. If you want to see ALL rooms for that building, click on the Search button, and then click on the Return Value link to return the desired room to your document. Or, enter the desired room number in the Building Room Number field, and click the Search button. NOTE: Most Building Room Numbers are four-digits long and include leading zeroes. For example, a Building Room Number 5 is entered in the system as 0005. In other words, if you enter 5 in the BuildingRoom Number field, you won't get results, but if you enter the room as *5* you will get results. What About Equipment Not Located in a UC Davis Building/Room? On the Requisition, click the Off Campus button next to the Building field and manually enter the address where the asset is located, in the Location section of the Capital Asset tab. On the Asset screen, enter E001 as the Building and E001 as the Room and manually enter the address where the asset is located in the Off Campus section of the Asset Location tab.